The rich are getting more mortgages. The poor are getting more car loans. Adjustable-rate loan, a place you can sleep, a radio… still not a house. On Wednesday, the New York Fed confirmed that Americans had finally reached a symbolic marker of recovery from the Great Recession: a new record for household debt. Americans personally owed $12.73 trillion at the end of March, an amount that finally surpasses the $12.68 trillion we owed in September of 2008, before the economy tanked. It’s basically an arbitrary milestone, since the number isn’t adjusted for inflation, and doesn’t account for how much bigger the U.S. economy is now—as a percent of GDP, household debt isn’t even close to where it was nine years ago. We owe money for different stuff now. Student loans now make up 11 percent of household debt, up from 5 percent in 2008, which is one reason student loans became a campaign issue in 2016, and a reason that everyone and their mother is reading my colleague Jordan Weissmann’s post about student loan forgiveness. Something else is also happening with auto loan debt, which is up to 9 percent of U.S. household debt from 6 percent in 2009. For much of the 2000s, auto loans and home mortgages rose in sync, suggesting either that houses and cars are complementary purchases that get made together, or that at least houses and cars responded to the same underlying economic trends. But that link came unstuck five or six years ago, and auto loans haven’t looked back. 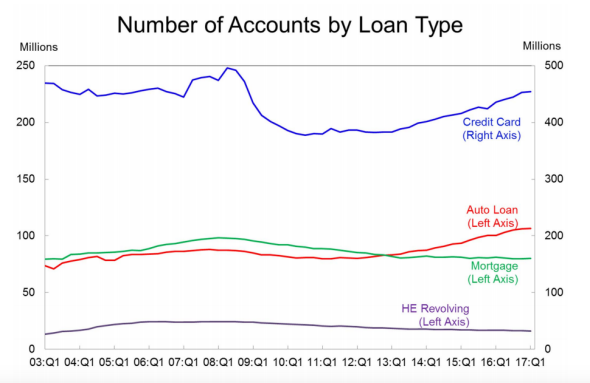 There are far 107 million loan accounts for car purchases, far more than for home purchases. It’s probably not that Americans would rather own cars than homes, but that it’s just so much easier to borrow money to buy a car. Why is that? Partly because expensive debt goes where it can, and has flowed into the auto loan business (ridden with complex, exploitative contracts) from the more tightly regulated mortgage industry. Furthermore, housing prices have recovered from the crisis, which means buyers need big loans and good credit to get them. More than 60 percent of new home loans go to borrowers with super-high credit scores, a record since record-keeping began in 2003 and double what the share was then. You can see that the same rigorous standards don’t apply to auto lending, where the credit score of the median borrower was 706—versus 764 for the median homebuyer. 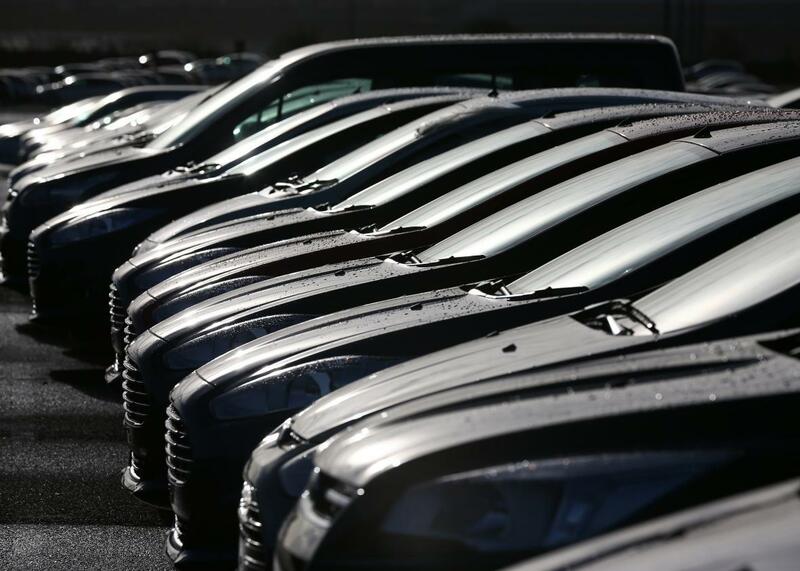 Lately auto sales have slowed down, just as lenders have tightened their approach (the median credit score is rising), and financial observers have started to warn about a crisis in consumer debt. The takeaway is that this is a country where Americans have an entirely different relationship to their largest assets than they did 10 years ago. Homeownership is at its lowest level in 50 years. Car ownership has crept back up toward its all-time high, which we reached in 2006, despite all the talk about shared mobility and the stereotypical preferences of millennials. There’s a big price difference between cars and houses, of course: While auto debt per circulating car has gone up 44 percent since 2009 to $8,200, it’s a pittance compared to mortgage debt. Still, it’s not great that so many Americans owe so much money on cars. Used cars have nose-dived in value since last summer. In March, J.D. Power’s Used Vehicle Price Index fell to its lowest level since 2010. The depreciating, underwater asset of the day, in short, isn’t the McMansion anymore—it’s the Ford F-150.